Bedspreads & Bedspread Sets - Twin, Queen, King | Collections Etc. 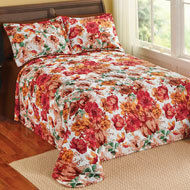 Make your bedroom as cozy as they come with bedspreads from Collections Etc. With a wide variety of bed coverings for any size bed and any style bedroom, these styles will help you create a comfortable, relaxing sleep sanctuary. We offer king, queen, full and twin bedspreads at a great price, perfect for the master, guest suite or kids’ room. Explore our entire assortment to find a bedspread set that comes with everything you need to transform your bed into a luxury oasis for sweet dreams or pick out bedspread only to suit the sheets and pillows you already own. Our team has hand-curated and designed a selection of quality, good-looking styles to top off any bed and complement any décor scheme. We have a great assortment of chenille, lace, quilted and ruffled bedspreads that bring a romantic, traditional feel, as well as plenty of pretty floral bedspreads that bring big color and style to your space. Whether it’s a ruffled bedspread for your Victorian guest suite or a floral bedspread for the master, you can be sure it’ll bring the perfect blend of comfort and style. 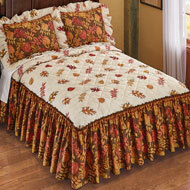 We also have many seasonal and holiday bedspreads here that you can use to add a festive feel to your sleep space. Whether you’re looking for king size bedspreads or twin sizes for your bunk beds, Collections Etc. has a great variety perfect for outfitting your entire home.. Complement your new bedroom design with bedroom accessories from our store, including stylish accent pillows, shams and sleeping pillows that will put you in a trance-like state for deep, productive sleep. Collections Etc. specializes in unique and exclusive products at a great value, so you can upgrade your bedroom without breaking the bank.